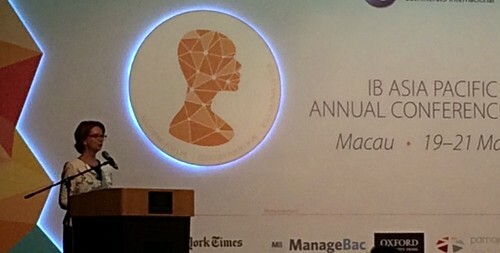 I am at the International Baccalaureate Asia Pacific Annual Conference 2015 in Macau. The keynote speaker is former Australian Prime Minister, Julia Gillard (2010-2013), a labor party politician. Before becoming prime minister, one of her posts was Minister of Education, Employment and Workplace Relations and Social Inclusion. She is now a non-resident senior fellow at the Brookings Institution in Washington, working with the Center for Universal Education (CUE) She is also Chair of the Board of the Global Partnership for Education. The CUE is a policy center and think tank that works on improving access to quality education for all in developing nations. Her talk today is answering the question, “How can the world ensure a quality education for all, in both developing and developed nations?” She will also discuss how IB assessment practices can drive global student achievement. MACHINES The digitization and rise of robots or artificial intelligence is a major revolution in our society, the second machine age. Machines are increasingly able to do routine, repetitive knowledge work, like filling out taxes, payroll accountants, call centers, etc. Non-routine, non-manual work is the safest of all from machines. She cited the book, “The Second Machine Age: Work, Progress and Prosperity in a Time of Brilliant Technologies“, by Erik Brynjolfsson and Andrew McAfee. What does this mean for our children? MONEY Asia, especially China’s unprecedented growth, is the biggest opportunity for our students. In a few years time, our region will be the home of the biggest middle class in the world, more than the rest of the world combined. For example, Apple was the first company to hit a market capitalization to hit $700 billion, and it did so through selling products to Asian consumers. The needs of this middle class include quality education, hence the rise of private, international schools. The world will hunger for people that can forge links to Asia. MEN She also mentioned her experience at some of the economic summits, where she was the only woman (example above). The importance of education of equality for gender is imperative. She cited numerous studies that show students unconsciously favor male teachers over female teachers, which means cultural stereotypes run deep and women in leadership are viewed negatively. Machines, Money and Men are the prism that she looked at the future. Under 2% of developing country aid goes to education. So many of the world’s ills can be helped through education. We as international educators must push for more funding to go towards schools in developing nations. Privileged IB schools have the responsibility to work towards gender equality and better schools in the developing world.